After taking AP Environmental Science, I thought I knew a lot about oceans and coral ecosystems. Seeing textbooks and presentations is one thing, yet it’s entirely different to witness firsthand what truly goes on in our world’s vast oceans. Ocean Matters gave me, along with 19 other high school students, a key to underwater exploration and discovery through Open Water and Advanced PADI Certifications. Swimming 40-60 feet beneath the waves with such a diverse group of young scientists was an unforgettable and beautiful experience. But one major impression that our dives left was that the coral reefs no longer look exactly the way they do in AP textbooks and presentations. We have all been told at one point or another that our world’s coral reefs are in jeopardy, but prior to this Ocean Matters experience, I did not truly understand what that meant. Coral reefs are living creatures, valuable for both natural and economic reasons. They provide shelter to animals, serve as carbon sinks, produce oxygen, and buffer nearby islands from waves, storms, and floods. They also promote the tourism and fishing industries. In order to provide such benefits, coral needs certain conditions to survive, such as clear, moderately warm, salty water. Yet every day, human actions are denying coral reefs these necessities, sending them on a downward spiral. Regional threats, like overfishing, coastal runoff, and coastal development are infecting local waters and filing away at their biodiversity. On a larger scale, each human action that contributes to global warming is gradually heating our waters, triggering the stress response known as coral bleaching, a process where coral expels the zooxanthellae (algae) that live in its tissue, eliminating its color and turning it white. Without the zooxanthellae, coral loses its primary food source and becomes more susceptible to disease, making it much more difficult for coral to provide the services our waters depend on. On some of our PADI excursions, we witnessed colorless coral, damaged reefs, and fewer aquatic animals than anticipated. It was a grim and shocking discovery. We can choose to conserve water, pick up trash, eat sustainable seafood, keep coral untouched, use coral-safe sunscreen, and prevent chemical runoff through mitigated fertilizer use. Together, our group of 20 worked with Chris Gawle, the Ocean Matters director of Marine Biology, to learn not only about the threats facing coral reefs, but also the ways to restore and protect them. We pledged to raise awareness, so I want everyone reading this blog to realize that there are things we can do. We can choose to conserve water, pick up trash, eat sustainable seafood, keep coral untouched, use coral-safe sunscreen, and prevent chemical runoff through mitigated fertilizer use. These are just some of the ways we can be proactive to keep our reefs healthy. 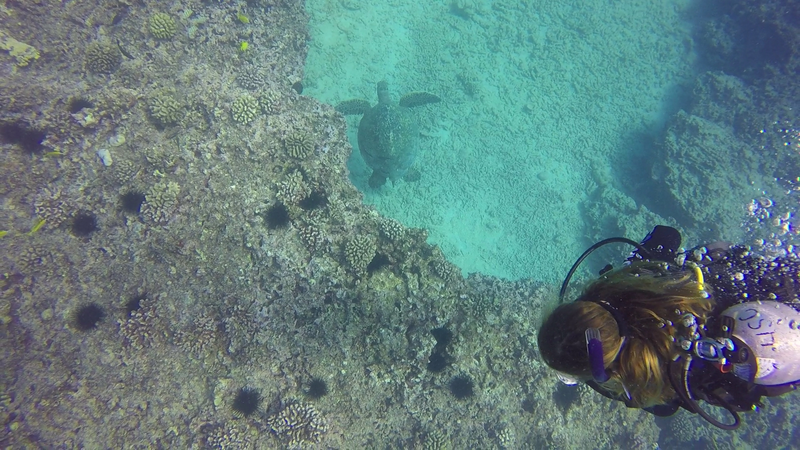 Hawai’i was the most beautiful place I’ve ever seen, and its waters were magical, but there’s work to be done. A Hawaiian storyteller told our group that we are descended from the coral, so it is our duty to protect it. With a little effort, I hope one day the Hawaiian reefs we visited will again look just as vibrant as the images in my school textbooks. ← Never Doubt. . .